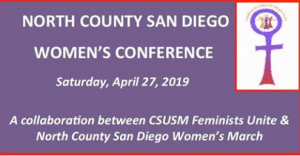 Join us at the Campus of California State University San Marcos for the North County San Diego Women’s Conference hosted by North County San Diego Women’s March. You can purchase tickets through the Facebook event page here. Register here to attend the 4th Annual Symposium on combating violence against women and girls. Event is free. 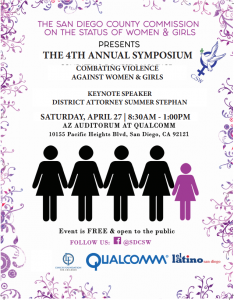 District Attorney Summer Stephan is confirmed to be the keynote speaker. 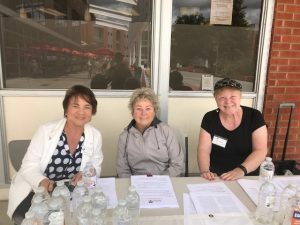 AAUW COV members MJ Giotta, Lee Whipple, Nancy Hackert, Kathi Harper at Mira Costa College. Members Seena Trigas, Belle Bohn, Lynda Daniels visiting Palomar College. April 2nd is Equal Pay Day. 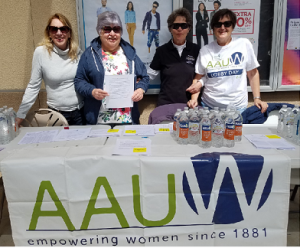 On April 4th, some of our members talked to students at Mira Costa and Palomar Colleges about the Gender Pay Gap and the Paycheck Fairness Act, an important bill that will help to close the Gender Pay Gap. See article on our Public Policy page for more information.